Polyolefin dispensers delivers high volume with easy-pull trigger. Plastic parts are polyethylene and polypropylene. Spring and check ball valve are 302 stainless steel. Heavy Duty Trigger Sprayer delivers .9cc per stroke. Nozzle is adjustable from a fine mist to a steady stream. 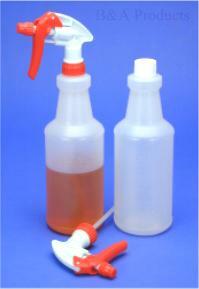 HDPE Spray Bottle is perfect for cleaners, waxes, and disinfectants. 32 ounce carafe style includes white polypropylene cap with F-217 liner.